There are no minimum purchases required. The starter kit contains everything you need to become a Member. It includes Herbalife® products (Formula 1 Healthy Meal Nutritional Shake Mix 750 g, Formula 2 Multivitamin Complex, Formula 3 Cell Activator®, Herbal Tea Concentrate 50 g, and Liftoff®), a handy tote, important product literature, applications and forms. The sampler version of the start-up kit for new Members includes the forms, applications and collateral you need, including important product literature. 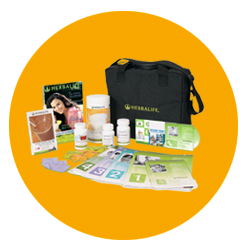 It also includes a handy Herbalife tote and samples of a variety of Herbalife® products. First 3 letters of Sponsor's Last Name? Purchase and Herbalife Member Pack(HMP) from Sponsor?